The first thing most of your female patients will ask you when you recommend custom foot orthotics is “Will I have to buy new shoes?” or “Can I still wear my shoes.” Women and their shoes is a love/hate relationship. We want to Feature our Women’s CasualFit and CasualFit Plus this month. Our women’s dress series of orthotics is designed for women who want to wear stylish shoes. For those women who will not compromise fashion for comfort, we have the answer with our Casualfit, Casualfit Plus and Slimfit devices. In addition, our Graphlite carbon composite can be substituted for any of our standard shells in the dress orthotic series, making them even more appealing with graphlite’s thin, lightweight features. Our standard top cover is burgundy vinyl and our standard length is sulcus length on all of our women’s dress devices. The CasualFit is designed for narrow pumps and flats. It has a low profile orthotic for support and shock reduction and the shell is cut away from the 5th met base to the 2nd interspace, allowing better fit for shoes with a more narrow shank. The CasualFit Plus is designed for high heels and open-back shoes and sandals and is the best choice for boots. It is slim (cut more narrow) throughout the medial and lateral border and has a full width forefoot. The CasualFit Plus provides greater control. Both the CasualFit and CasualFit Plus have natural subortholene shell, intrinsic RF posts and a suede bottom cover. The standard length is to the sulcus with a burgundy vinyl top cover but as with all of our devices you change the length and select from one of our 7 top cover choices and add any additions/modifications at no charge. Shipping is always included in our flat rate custom orthotic pricing. ComfortFit Labs is a company with over 35 years of solid orthotic experience and a commitment to operational excellence. 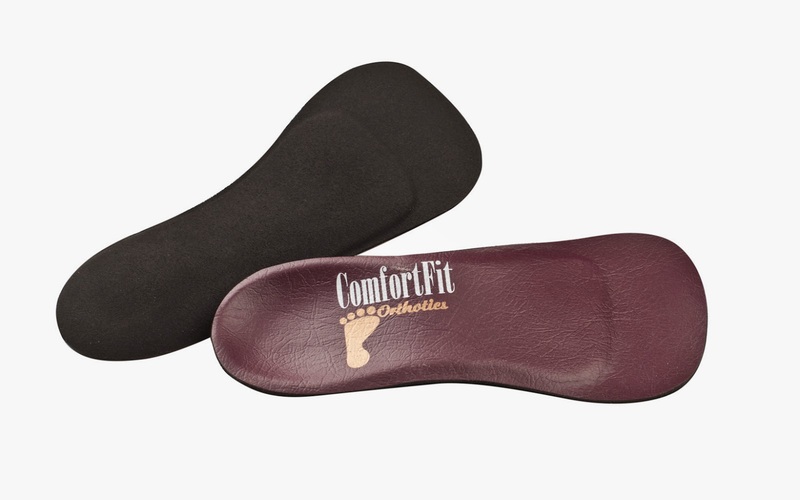 ComfortFit Labs was created with the goal of producing a quality orthotic at a reasonable cost with superior customer service and technical support. We are focused on our customer and strive to make working with us as simple and pleasant as possible. This is evident in our decision to offer you several ways in which to place an order, have your finished product shipped back to you, and communicate to us your needs as well as those of your patients. Not to mention our flat rate orthotic pricing that includes ALL in and outbound freight, no charge rush option, and our interactive web site with downloadable order forms, detailed product information and our customer order status feature which allows you to track all of your orders as they move through our lab.